Disney Pixar has released a brief new teaser for The Incredibles 2, to get fans ready for the new sneak peek footage debuting tonight during NBC's coverage of the 2018 Winter Olympics from Pyeongchang, South Korea. The studio also released a new poster earlier this week, that turned out to be the first of three, showing Mr. Incredible's (Craig T. Nelson) laundry routine, as the domestic caretaker of this superhero family. The first poster that debuted on Monday showed Mr. Incredible's super suit in a laundry basket, while the second poster shows the suit in the washing machine, while the third shows him ironing this suit, as he gets ready for battle. The brief preview of this Olympics sneak peek footage offers a new look at Jack-Jack, who is sitting on the ice, enjoying a bottle, when he's bumped a bit further down by a curling stone. 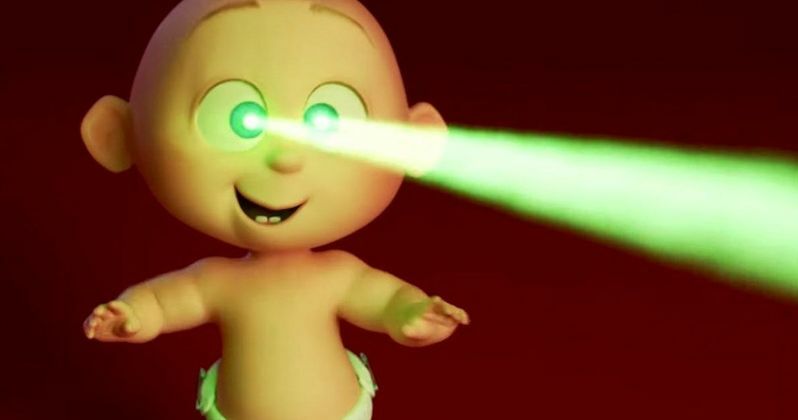 The playful Jack-Jack uses his powerful eye lasers to slice this curling stone in half. This video was specifically designed for the Winter Olympics, and doesn't feature any actual footage from the animated sequel, but we'll get a new look later tonight during the Olympic games. In The Incredibles 2, Helen (voice of Holly Hunter), a.k.a. Elastigirl, is called on to lead a campaign to bring Supers back, while Bob (voice of Craig T. Nelson) navigates the day-to-day heroics of "normal" life at home with Violet (voice of Sarah Vowell), Dash (voice of Huck Milner) and baby Jack-Jack-whose superpowers are about to be discovered. Their mission is derailed, however, when a new villain emerges with a brilliant and dangerous plot that threatens everything. But the Parrs don't shy away from a challenge, especially with Frozone (voice of Samuel L. Jackson) by their side. That's what makes this family so Incredible. The Incredibles director Brad Bird (Iron Giant, Ratatouille) returns to write and direct this sequel, which is produced by John Walker (The Incredibles, Tomorrowland) and Nicole Grindle (Sanjay's Super Team short, Toy Story 3 associate producer), DisneyPixar's Incredibles 2 busts into theaters on June 15, 2018. This animated sequel was originally slated for a summer 2019 release date, but the studio later swapped dates with Toy Story 4, which now has the June 21, 2019 date that Incredibles 2 was initially slated for. he Incredibles grossed more than $633 million worldwide during its original box office run, debuting with an opening weekend of $70.4 million, which was, at the time, the second-largest opening at the time for an animated feature. The Incredibles won an Academy Award for best animated feature film of the year. When The Incredibles 2 hits theaters this June, it will be facing the Warner Bros. comedy Tag starring Jeremy Renner and Sony's SuperFly remake starring Jason Mitchell. Take a look at this brief preview, courtesy of Disney Pixar Twitter, along with the trio of posters below.